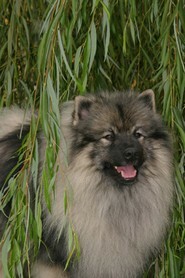 The German Spitz has a double coat : Long, straight, stand off top coat and short, thick, cotton-wool-like undercoat. 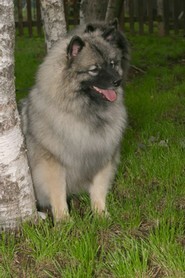 Head, ears, front side of front and hind legs and the feet are covered by short, thick (velvety) hair. The rest of the body has a long rich coat. Not wavy, curly or corded, not parted on the back. Neck and shoulders are covered by a thick mane. The backside of the front legs is well feathered, the hind legs have ample feathering from croup to hocks. The tail is bushy. The Spitz’s medium size head, seen from above, appears broadest at the back and tapers in wedgeshape to the tip of the nose. Stop : Moderate to marked, never abrupt.The cheeks are gently rounded, not protruding.The muzzle is not overlong and stands in pleasing proportion to the skull. 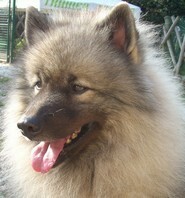 The nose is round, small and pure black, dark brown in brown Spitz.The lips are not exaggerated, close fitting to the jaws and do not form any folds to the corner of the mouth. They are completely black in all colours, brown in brown Spitz. The eyes are of medium size, longish shape, slightly slanting and dark. The eyelids are black in all shades of colour, dark brown in brown Spitz. The small ears are set high and relatively close to each other, triangular and pointed; they are always carried upright, stiff at the tips. The jaws are normally developed and show a complete scissor bite with 42 teeth, corresponding to the teeth formula of the dog, i.e. the upper teeth closely overlapping the lower teeth and set square to the jaws. 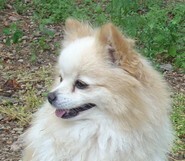 In Miniature-and Toy (Pomeranian) Spitz the lack of a few premolars is tolerated. Pincer-bite is permissible in all varieties of Spitz. Straight, rather broad front. The shoulder-blade is long and well laid back. The upper arm, which is approximately the same length, forms an angle of 90 degrees to the shoulder-blade. The shoulder is well muscled and firmly connected to the brisket. The elbow joint is strong, close fitting to the brisket and turns neither in nor out. The forearm is of medium length in relation to the body, sturdy and completely straight. The back of the forearm is well feathered. The strong, medium length front pastern stands at an angle of 20 degrees from the vertical. The front feet are as small as possible, round and closed, so called cat feet, with well arched toes. Toe-nails and pads are black in all shades of colour, but dark brown in brown dogs.. The hindquarters are very muscular and abundantly feathered to the hocks. The hind legs stand straight and parallel. Upper and lower thigh are of about equal length. The stifle joint is strong with only moderate angulation and is turned neither in nor out in movement. The hock is of medium length, very strong and vertical to the ground. The hind feet are as small as possible, tightly closed with well arched toes, so called cat feet. The pads are coarse. The colour of nails and pads is as dark as possible. The deep chest is well sprung, the forechest well developed. The topline starts at the tips of the erectly carried prick-ears and merges in a gentle curve with the short, straight back. The bushy, sweeping tail, which partially covers the back, rounds off the silhouette. The high withers drop imperceptibly into the shortest possible, straight, firm back. Croup : The croup is broad and short, not falling away. Lower line : The brisket reaches as far back as possible; the belly has only a slight tuck up. Serious faults: Faults in construction. Head too flat; distinct apple head. Flesh-coloured nose, eyelids and lips. 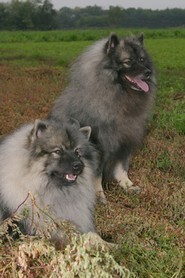 In Wolfspitz/Keeshond, Giant Spitz and Medium size Spitz missing teeth. Faults in movement. 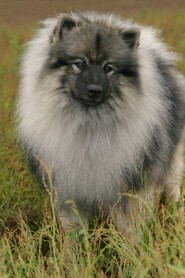 In grey-shaded Spitz missing of distinct markings of the face. Eliminating faults: Aggresive or overly shy Gap in fontanel. Over-or undershot bite. Ectropion or entropion. Semi-pricked ears. Definite white patches in all not white Spitz. Any dog clearly showing physical or behavioural abnormalities shall be disqualified.